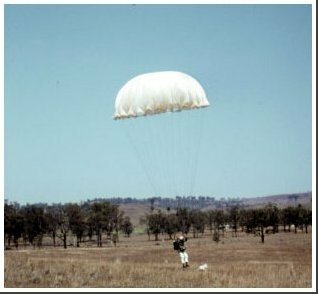 Parachuting at Camden in the 1960's. 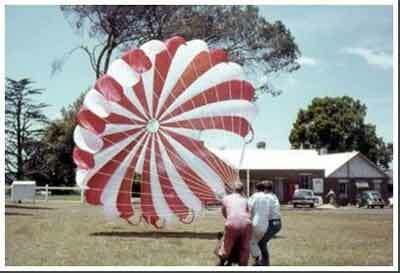 A 28ft diameter ex-military parachute canopy. Slots were added for the sporting parachutist. Because military pilots may be injured, unconscious, or at low altitude after ejecting there were no steering slots. These were added to give some forward speed and more manoeuvrability. 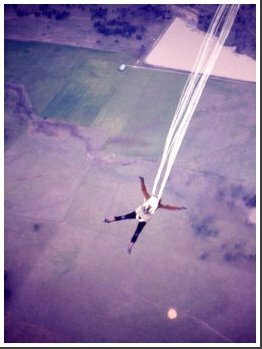 This parachutist is pulling on his right steering line. This can be seen distorting his right slot, causing a turn to the right. Ken Bath, my instructor putting me through emergency procedures on a very Lo-tech simulator at Camden airport. This was just before the very first jump. 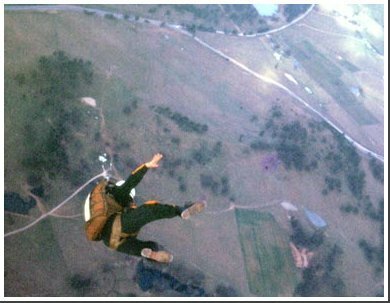 (from a fixed-wing aircraft) That first jump was a numbing, fearful experience. I found the second jump even more terrifying. 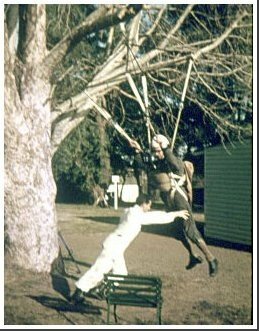 (most others agree) Tandem jumps for training were unheard of at that time. I found the fear died after about 20 jumps. Once you realise that parachutes really seem to work, it becomes most enjoyable. An emergency parachute in use. His dog waits. These had a small, 24ft diameter canopy, and very little steering ability. 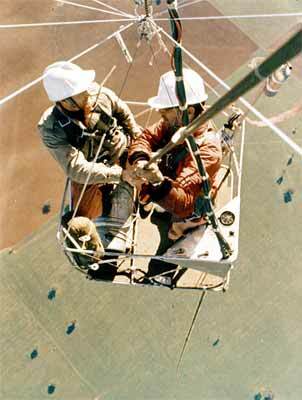 Those used by balloonists or glider pilots were usually from World War II. Bomber crew would wear just the harness, then clip the parachute pack onto the chest in an emergency. 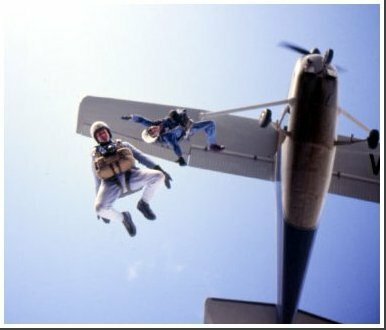 An experienced sky diver, can make quite an untidy exit from the plane, as long as he is in the correct body position when the parachute opens. Unlike today, landings were usually hard, so solid boots with ankle support were needed. A crash helmet was essential as well. It was at least 50 jumps later, before I was able to take pictures like this, using a camera on my helmet. We are at about 8,000 ft. (2,500 metres). We flew with the door off giving us a cold ride up. On a later jump we discovered it was raining below, and it was incredible (and painful on the face) to see rain drops hurtling UP at us like silver bullets at about 100 mph. After the chute opened the drops could be seen falling ever so slowly down beside the parachute. This jumper is moving his arms back and will straighten his legs to form the shape of an arrow. The "delta" position. This means he can glide, but only slightly better than a brick. He may move forward at 60 miles per hour, while coming down at about 200. In this flat "frog" position, there is a low pressure area above the jumper's back. A large spring propelled pilot chute when released, jumps out of this turbulent zone and into the main airflow, dragging the main chute where it can be inflated. 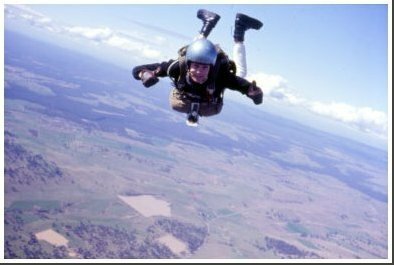 Some skydivers assume a near sitting position at this point, which assists a smoother airflow up the jumpers' back, hence a faster parachute deployment. The flexible metal cable over his shoulder carries a steel ripcord. On his stomach is a small 24ft emergency parachute, as we carried in the balloons. For skydiving, this pilot chute was removed.Mounted on the emergency pack, is a small instrument panel consisting of altimeter + stopwatch. The feeling of weightlessness is greater with a balloon jump, because there is no initial slipstream. However, this means a parachute opens slightly slower jumping from a balloon. Don't ever "count to 10" - you will have dropped 1000ft. After about 10 seconds a jumper has reached a terminal velocity of about 120 miles per hour, and has fallen 1,000 feet. From then on it takes about five seconds for each one thousand feet. Those used by balloonists or glider pilots were usually from World War II. Bomber crew would wear just the harness, then clip the parachute pack onto the chest in an emergency. That can be seen here as Keith Wilcox and I fly over Canowindra in EGO wearing harness only. 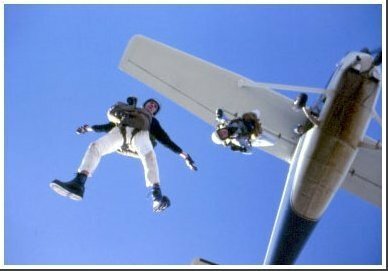 Head down, a sport parachutist can reach excessively high speeds, well above normal terminal velocity. It can be dangerous to open the parachute at such speeds (although much better than not opening). The author had such a canopy "explode" on opening. 18 of the 28 panels were ripped, 3 of them from top to bottom. Some red nylon was actually melted onto the white and vice versa. Balloonists should have no reason to delay their opening for more than a few seconds. 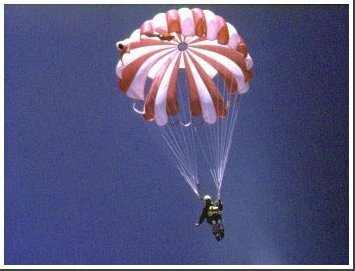 The parachute opening can be quite a savage impact, especially on the groin, however, it is always welcome. Without that impact, the next one - ? There were no digital cameras around 1970. Here we see the author getting ready for a jump. 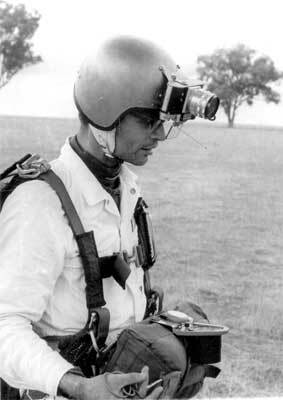 That's a 35mm film camera mounted upside down on my helmet, along with a primitive aiming device. There's a squeeze bulb in my right glove, and an air tube running inside my overalls to the camera. The camera was not automatic in any way, so it was necessary to reach up and wind the film for the next shot. The small emergency parachute had no pilot chute. This was to prevent the emergency chute being dragged up into the main chute, where it would probably tangle. The idea, was that if the main chute failed to open properly, the emergency chute would be literally grabbed in both hands and thrown out horizontally where it should inflate beside the malfunctioned main. This procedure saved my life on my 13th jump.